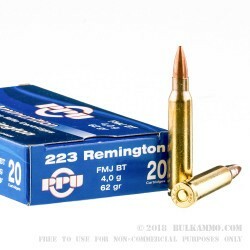 Pick up a few of these boxes of .223 Remington ammunition from Prvi Partizan for your AR-15 or other .223/5.56 NATO rifle. 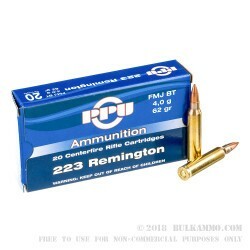 These cartridges deliver good medium-range accuracy and reliable ignition at a reasonable price. 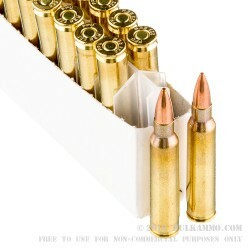 Each cartridge in this box of 20 fires a heavy 62 grain full metal jacket bullet at 3,042 feet per second. 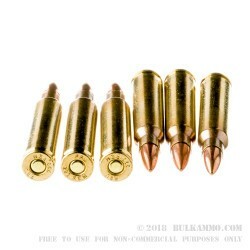 The bullets have a boat tail that helps stabilize the bullet in windy conditions; expect external ballistics comparable to those of M855 mil-spec ball, to which this ammunition is very similar. Prvi Partizan ammo is loaded in Uzice, Serbia using non-corrosive Boxer primers. The brass used in this ammunition is unpolished like mil-spec cases and has intact annealing marks.